Helps increase the total sleep time (aspect of sleep quality) in people suffering from sleep restriction or altered sleep schedule, e.g. shift-work and jet lag. Helps to prevent and/or reduce the effects of jet lag (e.g. daytime fatigue, sleep disturbance) for people travelling by plane easterly across two or more time zones. Helps to reduce the time it takes to fall asleep (sleep onset latency aspect of sleep quality) in people with delayed sleep phase disorder. Helps re-set the body’s sleep-wake cycle (aspect of the circadian rhythm). 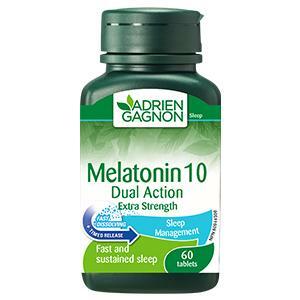 A bi-layered tablet with a fast dissolve side releasing 5mg melatonin and a delayed released side that provides another 5 mg for a prolonged effect and to avoid awakenings too early in the morning.